Play time is the best medicine to heal a wounded soul. Where is your fun? Find it now! Whatever painful circumstance has swelled into your life Otter’s spirit totem teaches us to dive under trouble and watch it roll on by. This acrobat lives her life among jagged rocks and crashing waves. Her survival tactics on treacherous coast lines are to twirl and play. Play time is the best medicine to heal a wounded soul. What do you find fun? Otter says, do that now. Waste no time on why you shouldn’t. Only in exploring our hearts desire can we ever know the contents of it. When Otter medicine arrives in your life, it’s time to reconnect your goals with the spirit of fun which compelled you to engage in those goals in the first place. How do we keep life fun? Why do activities and relationships lose their enjoyment? And how do we get that enjoyment back? Otter medicine teaches us how to keep the party going. This fisherman understands the intrinsic wave nature of life. Her intuition can read a wave force from miles away. Her name comes from the Old English word: wodr, meaning water which is where her spirit is most at home. The waves keep coming. How you play with them is up to you. Do you want to dive under this next one? Do you want to ride it into shore or do you want to let it tumble you about? 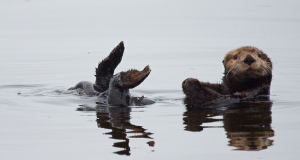 Otter medicine is a sensual dance with the ever changing nature of the tides. She knows when to shift and when to hold ground. She is a call to develop your own kinesthetic senses of the waves of experience around you so that you can perceive with greater accuracy the effects of the influences approaching you. Did a tiny glance from a new acquaintance compel you to keep your distance? Did a tone of voice clue you into how trustworthy someone is? Otter says, listen to your senses and go with the currents of your emotions. The more you trust yourself, the more trustworthy you become. Otter teaches us how to float and listen to our soft quiet inner voice. It is that voice who will instruct us on how to move with perfect grace through a storm and land onto new shores without falling apart. Otters take play time very seriously. Having fun is the meaning of her life. In Otter’s world all beings are playful until proven un-playful. Her medicine is a spontaneous celebration and an eagerness to applaud others. She offers lessons in collective cooperation. 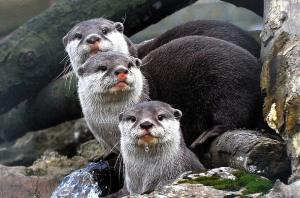 There is no leader in a holt of otters. Leadership in play time cycles through whichever team member has the most information for the next task at hand. All differences are welcome as fascinating curiosities and competition is viewed as two players playing their best game. This medicine teaches us to seek worthy playmates whose skills will improve our own. 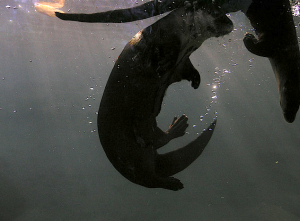 So serious is Otter’s need to play that finding time for playing is like finding time for eating. Fun is a life imperative, not a luxury. If unhappiness has lodged itself into your life for more than a week, it is urgent that you go find something you enjoy. All the complications will sort themselves out when you turn off the brain and get in the water. 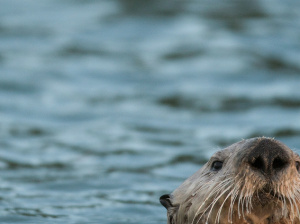 To do anything well, Otter knows she must open herself up to the experience completely and allow herself to be changed by the unpredictable forces of nature. The profession of acting is the best example of Otter medicine at work. Actors make playing a full time career. What is often overlooked by audiences, and actors themselves, however, is that acting is an athletic sport not of the body, but of the heart. Great performances happen when actors take the events of a story personally. It is not possible for an actor to do her job well from a distance. To take something personally you have to let it into your heart. To do that you must keep your heart open and curious. Like a tennis player practicing his serve, actors practice responding with all their hearts on a daily basis. Such bravery requires a spiritual understanding that the given circumstances of the story at hand are for the play of it all. Actors press into the curve of an emotion with the speed and skill of a race car driver because their playful spirits trust that wherever the experience takes them it will be an excellent ride. In this way, actors are emotional athletes. It would be unthinkable for an Olympic runner to step onto a track with a broken ankle. But actors step onto stages with broken hearts every day. The heart’s feelings, though emotional, are as real and fragile as bone and must be looked after with the same care and attention found in sports medicine. And unlike physical athletes, artists can make any situation a game field, even sitting on the bench for a few rounds. Otter urges us to make healing fun. Recuperation time can be just as much fun as the exertion time and can also lead to significant art.Otters have a gland behind their ears that releases a water resistant oil. They can often be seen rubbing this oil all over their fur, loving and petting themselves. This essential grooming keeps them warm and dry in the frigid temperatures of the Pacific ocean. Athletes play hard and the professionals know that in order to keep playing, we must gauge our endurance and consciously recuperate after a good match.Because their craft is emotional and ‘unseen’, thespians are often not aware they are walking on an injury. All expressive arts from music, to poetry, sculpture, to public speaking are athletic sports of the heart and these artists must tend to the psychological and emotional effects of their adventurous explorations. 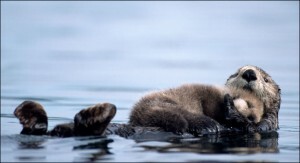 For a baby otter, Mother is the only land there is in the endless shift and depths of her new world. In all her soft vulnerability, Mother Otter stretches herself long for the new soul to grow. Mother is how we came to be. And this medicine finds a way to honor the high spirit of the Mother in every one. Whether it is the physical birth of a child, or the energetic birth of a project, everyone has a Mother within who nurtures and bears the pain of creative expression. This most feminine of medicine teaches us not only to honor the ones who raised us, but also to see that it is our community that is our only stability in an inherently unstable world. People are our land so be careful of too much isolation or hostility. In our western culture where the family unit has disintegrated over the past four decades, it can be a challenge to honor or forgive the parents who raised us. As we grow up it is confounding to look back and see how precarious the world was for us. And we often marvel that we ever survived at all. Otter guides us into that difficult process by asking us to first honor the parent within ourself who raised us equally with our birth parents. At birth our bodies our helpless, but our souls know what to do. Honor and applaud your soul for a job well done. You made it. When we reconnect with that silent guardian within who was there when we fell, when we were beaten, and when we failed, we are able to see that we are survivors. There is a maternal power within that does protect and care for us, and she does so eternally. Otter says, ‘Find your mother within and let her be your land.’ When we find that inner power it then becomes effortless to honor our physical parents and to see that Mom and Dad were struggling in a sea of their own. Not everyone can brave the sea. But you can, regardless of the lack of external role models in your life. In this world, there is no end to the depths of pain we have the freedom to explore. It may be time to stop investigating the depths of misery you are capable of sinking to. Otter knows that the ocean goes down and down and down with no apparent end. She decides on her own how far she’s willing to swim. When life has flooded, exhale and rise to the surface. Floating is your natural living state. Otter asks that we not dive too deep or swim out beyond our depths. Call on the breath and wisdom of Whale and Dolphin for lessons in deep diving. 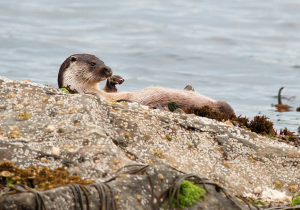 Otters are often observed tangling their wrists into a patch of kelp before falling asleep. This precaution is to ensure that the currents don’t carry them too far out to sea while they slumber. We can often be so swept up by a joyful mood that we lose our keys or leave our wallet. Keep anchored to your wits by internalize the heights of joy and let that joy cause an intensity within rather than a noisy racket around you. In matters of money, Otter suggests paying cash. When cash is low, it’s time to play with all the things you’ve already bought. When cash is flowing, spend it on yourself and the ones you love. Get a massage. Take a class. Who else is going to care for you more than you? 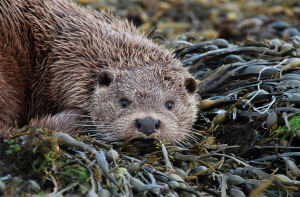 Otters are sea dogs and share many of the same qualities as their canine relatives on land. This coastal tribe is intensely friendly and inquisitive, but they are not without guard. Being playful is not the same as being naive. 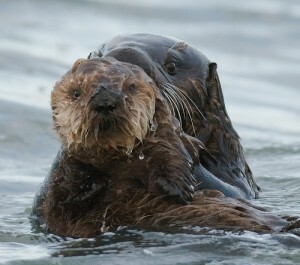 When boundaries are crossed, Otter’s fierceness can often seem shocking and uncharacteristic. But she is the guardian of good, honest fun. Any intentions to compromise the integrity of the game will not be tolerated. Playing involves vulnerability and a willingness to act foolish. For things to stay fun, trust and respect is essential. If the spirit of a game turns to devious ends, Otters may step off the field, leaving room for Coyote to roam. Otter medicine laughs with you. Coyote medicine laughs at you. If boundaries have been crossed and injury has been committed, a person with Otter medicine will not hesitate to show their fury and defend their integrity. They will often enjoy doing so as well, because Otter medicine people are always making whatever they do fun, even getting angry. But anger is just another tide to be released. Holding grudges is hard to do when you live in the ocean. Don’t stay upset for too long. It just isn’t fun. Find a way to vent and release. Life loves being alive. If it didn’t, it would die. Any obstacles that keeps you from returning to your natural state of play should be removed from your life immediately. The art of fun is a sacred power that keeps this magnificent party going. Otters message to you is: Go play for no reason other than because it is fun. Find the friendships that are eager to make a game of life’s challenge and watch each others backs. Devote yourself to the church of fun and trust that your true self will always guide you into greater health, greater joy and larger fields to play.